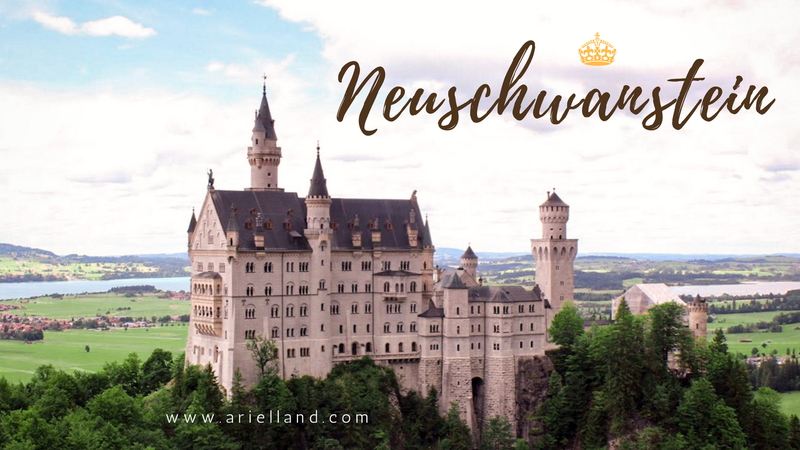 Being a Disney fan, Neuschwanstein castle was one of the first sites I learned about. It has been my dream to go there ever since. I looked up other blogs and guides online to see if I could get there myself, however they all seemed to actually be more expensive and troublesome than just booking a tour. We gathered at the Munich main station around 9am where the tour guide was waiting for us. The guide was super nice and energetic. He offered really entertaining stories but at the same time very informative. We got onto the train early so everyone got a spot to sit down. It's so nice to have an experienced guide to ensure a smooth and enjoyable trip. The train ran through the suburbs, south through the hilly terrains of Bavaria. There were fields of grass and flowers blooming everywhere. We passed by farms where cows roamed freely in lush green pastures. Germany is such a stunningly beautiful country. As we approached Füssen station, we are now bordering the Swiss Alps. The tall snow capped mountains tower over the surroundings. Virtually everyone getting off here was headed towards Neuschwanstein castle. Another good thing about being with a tour group - the busses are reserved, no need to queue up for a long time. It's another bus ride till you get to the foot of Neuschwanstein. It was almost lunch time when we got off the bus. My mom went and got a few hot dogs for us to share for now. And the guide continued on his story of how king Ludwig was mysteriously found dead in the lake nearby. To get up to Neuschwanstein, there are 3 ways, you can walk up, take the bus up, or take a horse drawn carriage up. After a pretty short discussion, my mom and I came to an agreement to walk both ways. The bus lines are chaotic, and the horse carriage was slow and stank. Plus, what's better than walking up a cool forest towards a fairytale castle? Before heading up, I bought my hat of the trip. It's been a ritual since I did my Trans Siberian trip with my iconic fluffy hat, each destination I'll get a hat for the trip! I found a super pretty white and blue hat, but also couldn't resist getting a German flag!! I know, it's so touristy. But I rarely see Germans using their own country flag! It's a pity with silly politics that people get slightly discouraged with waiving their own flag because of historical reasons. It wasn't too long or difficult of a walk up. And the view up there is spectacular! No wonder King Ludwig wanted to build a castle here! All castle entries must be accompanied by a guide from the castle, and people enter only for the time indicated on the ticket. Too bad no photos are allowed inside, but it was the first place in Bavaria with a phone line, perhaps the king was anticipating a foreign call? The most impressive was the paintings on the walls and ceilings. They were inspired by famous plays so it's as if the whole castle was telling stories to us. The tour ended quickly, and we ended up on a nice balcony outside the cafe, also a recommendation from the tour guide. And afterwards we headed to the bridge just behind the castle on another hill for the famous scenery. It is so famous thanks to instagram that it was absolutely packed! I wanted to climb up further to a hilltop but it was too steep for my mom and I. Unfortunately there were some really rude Italians and Spanish people there who didn't care if they were blocking or walking right into people ... I almost got into a yelling match with them. Tourists... and the worst kind too! Boo. We all met up with everyone again at the bottom of the castle. We had no time to get souvenirs (probably a good thing), so we got more hotdogs and a beer for the train ride home! We were absolutely knackered and knocked out sleeping with mouths opened on the swaying train. After getting back to Munich, a quick dinner and early bed time. The next day, we're off to the famous medieval town of Rothenburg, via the Romantic road. This is also another picturesque place I saw on Pinterest a couple of years back. I never thought I was going to make it there, but thank god for this tour company! It's possible without a car! Arial! that looks like an amazing tour! Hope you made tons of fond memories! May you carry the joy with you till eternity and beyond!